When it comes to choosing a professional speaker for your next event, you’ll find no one more respected or more knowledgeable in the field of business communications than Paul Barton, ABC. After hearing one of Paul’s high-energy presentations, audience members are inspired by the communication philosophies he presents and many say they can’t wait to get back to the office to try the practical approaches he offers. Whether a large lecture hall audience or a workshop group, Paul can deliver a tailor-made message of enlightenment and inspiration to business leaders, HR managers, and communication professionals. Paul’s style of speaking combines practical lessons learned from his real-life experiences at six of the nation’s fastest-growing companies with his intense passion and quick wit to deliver an enlightening and entertaining presentation. Paul has been a highly rated speaker by audiences at the International Association of Business Communicators (IABC), the Public Relations Society of America (PRSA), the Advanced Learning Institute (ALI), World at Work, and the Employee Benefit Research Institute (EBRI). He delivered an inspiring message as the featured speaker for Brown Mackie College commencement ceremonies in 2015. With a long history in the corporate world and as a current entrepreneur, Paul understands the everyday challenges faced by big and small businesses. Before launching his own company, he had a successful 20-year career leading internal communication teams at six fast-growing Fortune 500 corporations including APS, Phelps Dodge Mining Company, America West Airlines, PetSmart, Hawaiian Airlines, and Avnet. Those experiences led him to write Maximizing Internal Communication, which is the No. 1 book on internal communication on Amazon. As the principal consultant for Phoenix Public Speaking, Paul works with business professionals and others who don’t want public speaking to be the reason they are held back. Through personal coaching and workshops, he helps them gain the confidence to speak up and the skills to stand out so that they can command an audience. Paul also is a top-rated public speaking and business communication adjunct instructor. He has helped hundreds of people achieve their public speaking goals. 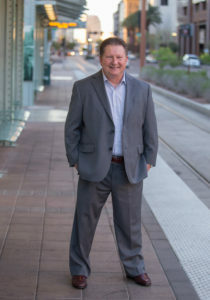 Paul Barton is Arizona’s Business Communicator. If you’re looking for a presenter who will both inspire and inform, then book Paul today!